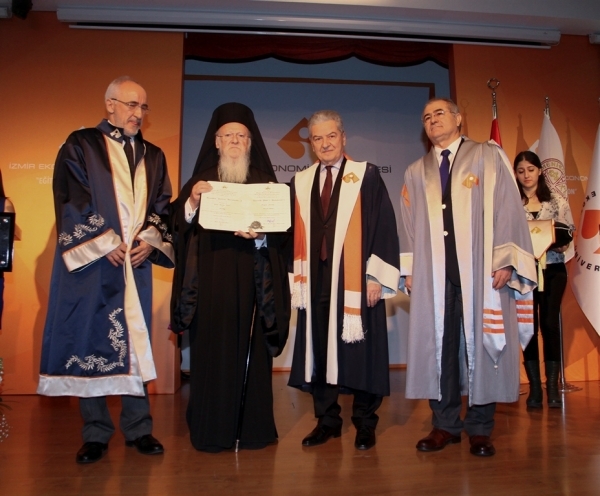 Ecumenical Patriarch Bartholomew I, the Orthodox Patriarch of the Phanar, was awarded the degree of “Doctor Honoris Causa (Dr.hc)” in “Sociology” by the Senate of Izmir University of Economics for his contributions and service to society and humanity; and for improving inter-faith dialogue. Ecumenical Patriarch Bartholomew I, Ekrem Demirtaş, President of IUE Board of Trustees, Sırrı Aydoğan, Acting Mayor of Izmir Metropolitan, Celal Kocabaş, High Court Chief Prosecutor of Izmir Regional Courts of Justice, Serpil Alpman, Izmir Representative of Ministry of Foreign Affairs, Işınsu Kestelli, Chairperson of Izmir Commodity Exchange, Theodoros Tsakiris, Consul General of Greece in Izmir, Geza Dologh, President of the Assembly of Chamber of Marine Commerce, IUE Rector Prof. Dr. Oğuz Esen, San Synod Representatives, members of clergy, guests, academicians, and students attended the ceremony that took place at IUE Conference Hall. “Our world is in crisis, indeed. Some people have strong convictions that they would rather sacrifice their lives than change their views. Others -we might say fundamentalists-are unfortunately even willing to take the lives of innocent victims to defend these views. This is why we are obliged to listen more carefully, to "look at one another" more deeply "in the eyes." 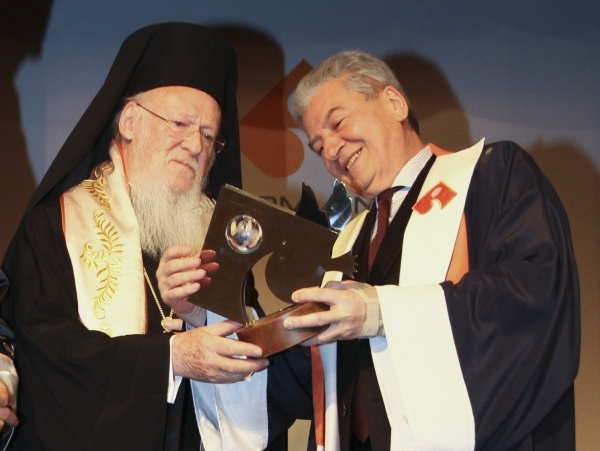 Bartholomew stated that this century must become an era of fraternity and solidarity; however, that would not be achieved without the contribution of religion. Bartholomew, who reported that dialogue was the antidote to fundamentalism, said that peace was not impossible. Izmir University of Economics conferred its first honorary doctorate to the 9th President Süleyman Demirel. 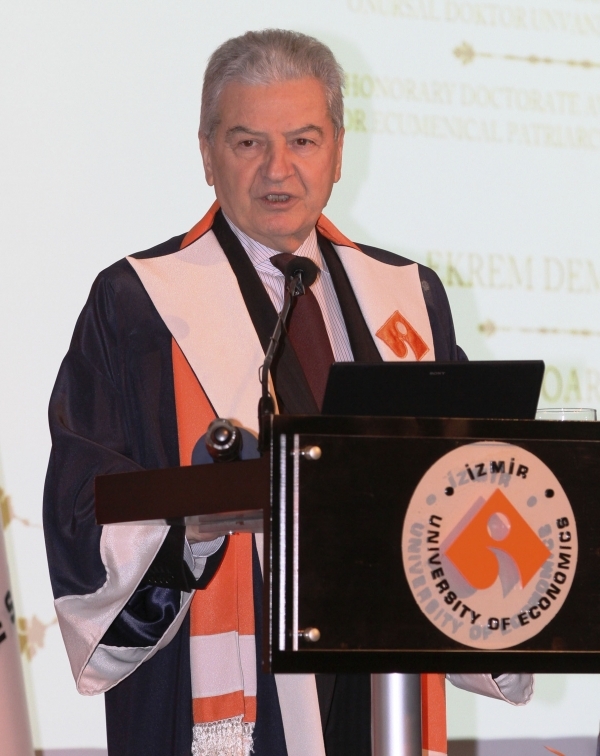 Later on, President of Turkish Union of Chambers and Commodity Exchanges, Rifat Hisarcıklıoğlu, and Former Prime Minister of Italy, Romano Prodi received honorary doctorates. 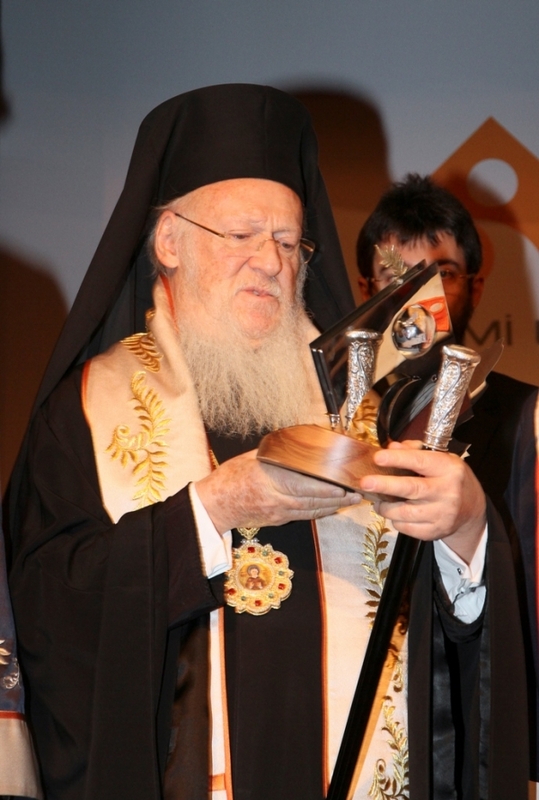 Ecumenical Patriarch Bartholomew I, the Orthodox Patriarch of the Phanar, is the fourth person to have received the degree of honorary doctorate. Bartholomew donned an honorary doctorate scarf designed and cretaed by the lecturers and students of IUE Department of Fashion and Textile Design.